I spent my Easter Sunday afternoon with a group of pilot wives. We were all in the same boat; our husband's were away working. We headed out after church for a lovely Easter Afternoon Tea in the Lobby Lounge at the Kowloon Shangri-la Hotel in Hong Kong. Brunch dining on the weekend is must-do in Hong Kong and many hotels create themed brunches for special occasions and holidays. When we entered the lobby of the hotel, we were instantly greeted with the fragrance of orchids and this beautiful bunny display. We did not know there was a protocol for booking tables by the windows with views overlooking Victoria Harbour, but our seating for four was very cozy and intimate. The buffet seemed like an endless choice of delicious delights such as smoked salmon, filet mignon, glazed ham, baked snapper, deep-fried shrimp, sushi, dim sum, salad, fruit and more and more and more (and so good I forgot to take a picture)! There was also a bottle of white wine and lots of desserts! Oh, coffee and tea were served at the end. We had the best time chatting and nibbling our way through the afternoon. On our way out of the hotel, we saw the cute themed smart car that is very typical in Hong Kong. So that is how I spent my Sunday. This morning I spoke to my parents on Skype and thought about all the fun times I had with my grandparents on Easter when I was little. 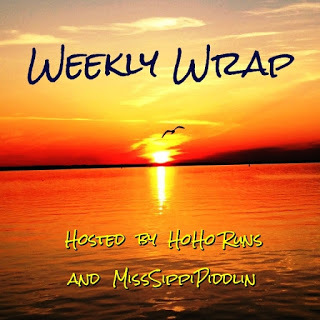 Here's my week of workouts ---> Linking up with Tricia and Holly for the Weekly Wrap! Wednesday- A nice long yoga session before my extra long and extremely dull hair appointment. I get it colored and keratin treated at the same time and every time I say I'm never doing it together again. Thursday - An easy yoga stretch session because I couldn't wash my hair for 24 hours, so I avoid getting sweaty. Friday - Yay! Bodystep twice this week! That hardly ever happens. Sunday - A little yoga to get the day started. But not goat yoga. Would you? Now, I'm gearing up to watch the Boston Marathon online. Here's a list of ways you can watch too. If you celebrate Easter, did you do something special? Do you workout on holidays? Do you have a connection to the Boston Marathon? I have several friends running and others volunteering. OMGosh! That's so exciting! I would love to see you if you have time. Please let me know ;) Yay! I have never been to Hong Kong. Love the Easter decorations. Your brunch looks delicious. That looks like such a fun time -- it's nice that you could all get together for that. It is! I'd go crazy without them. Looks like a wonderful expat Easter!!! How fun! Definitely not a typical holiday for me this year or maybe it is, ha! Holidays apart are never easy but thank goodness for FaceTime and Skype, right? Seeing a face is 100 times better than just a voice. That orchid display looks absolutely amazing and love the bunny themed dessert too! The picture doesn't do it justice...so pretty! The brunch looks scrumptious. I love the orchid display too. We grilled burgers and hung out as a family, except for our middle son who was away with college friends. The guys all played basketball. A very low-key (appreciated!) Easter. I'm intrigued by the goat yoga! Who thinks this stuff up? LOL. Thanks for linking, Amy! Just wow that hotel restaurant looks amazingly beautiful, and the food almost too pretty to eat, almost I did say almost! I so could see myself driving around this bunny car too! I bet she'd almost fit inside our motorhome! So very glad you've started to join us for the Weekly Wrap I love see what is going on in your world Amy! Haha, she is tiny! I'm glad I finally joined. Thanks for hosting!